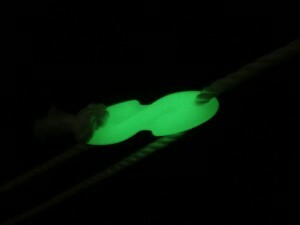 TripFree glowing tent rope tensioners allow you to see your tent ropes at night, with their constant glow so you don’t trip over them. Start enjoying Trip Free camping today, with your glowing tent rope tensioners. Sick of tripping over tent ropes at night? With TripFree glowing tent rope tensioners, you can now say goodbye to one of camping’s biggest hazards. In a convenient pack of 4, TripFree rope tensioners will glow for up to 12 hours after only a few hours in the sun, making them an effective and efficient solution to enable you to see your tent ropes in the dark… all night long! TripFree tensioners are suitable for all standard tent ropes, and will work with ropes thicknesses from 2mm to 8mm. To install your TripFrees, all you need to do is thread the rope through both holes, then tie a knot in the end of the rope. Once you’ve done this, simply pull on the rope section between the two holes to create the loop for your tent peg. Try to place the peg in the ground so that once you put tension on the rope, your TripFree tensioner will be 80-100cm from the ground. This will have your Tripfree at ideal height to be seen at night by campers of all ages (and heights), giving maximum benefit in reducing the likelihood of tripping. Most of all, enjoy your camping trip… just with a little less tripping.